The Senate hopes to have a final vote next week on legislation that extends the federal pay freeze in 2013, and funds the government through Sept. 30. Senate Majority Leader Harry Reid, D-Nev., wanted to wrap up work on the continuing resolution on Friday, but tussles over 99 amendments and procedural issues have slowed momentum. The upper chamber adjourned Thursday night at 7:37 p.m., and will reconvene Monday afternoon to resume consideration of the CR. The current continuing resolution expires on March 27. After the Senate passes its version, the two chambers will iron out differences between their bills and send a final version to President Obama. Both the House and Senate have included provisions that extend the current pay freeze for federal employees and lawmakers through the end of 2013. Senate Appropriations Committee Chairwoman Barbara Mikulski, D-Md., said she did not want to include the freeze for feds but that it was necessary to prevent a government shutdown. She likened the CR to the last helicopter leaving a disaster area. “The helicopter couldn’t take off if this modest pay raise was on it. I think this is a terrible mistake,” she said. “I hope that in next year’s regular order, we can make this up. But I want to say to my federal employees, this was a draconian choice.” Maryland is home to 130,000 federal employees. Obama issued an executive order in late 2012 that would end the two-year salary freeze on March 27 and give civilian federal workers a 0.5 percent raise in 2013. If the pay freeze provision remains in the continuing resolution that reaches Obama’s desk, as is expected, it will overturn that executive order. Mikulski worked closely with Sen. Richard Shelby, R-Ala., the committee’s ranking member, to craft legislation funding the government through the end of fiscal 2013 and upholding the spending levels mandated by the sequester. It also breaks out specific funding for the appropriations bills dealing with Agriculture; Commerce; Justice and Science; Defense; Homeland Security; and Military Construction and Veterans Affairs. The 587-page bill is more detailed than its House counterpart, but there are no major differences between the two so far that would derail negotiations. Earlier this week, Sens. Tom Coburn, R-Okla., and John McCain, R-Ariz., held up the legislation because they wanted more time to study it. The Appropriations Committee posted the text online Monday night. “I am willing to do whatever is necessary to make sure we get a continuing resolution, but I am not willing to do that blindly,” Coburn said Tuesday on the Senate floor, explaining why he put a temporary hold on the CR. Reid’s frustration with the stall was obvious during his floor remarks. 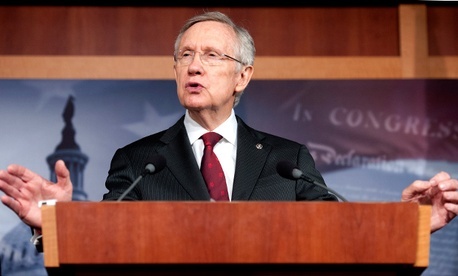 “I am sorry I irritated Sen. Reid,” Coburn said. “I am sorry he is upset with me, but I am going to do my job.” Coburn offered an unsuccessful amendment on Thursday that would have imposed a temporary hiring freeze on non-essential employees at federal agencies during the sequester. The Senate leadership will work over the weekend to streamline the amendments to the bill, so a final vote can happen before lawmakers leave town for the Easter-Passover holidays.